Last Saturday the wife asked me if I’d like to go with her to Edinburgh’s first Vegan Festival. I was tempted to say “Sure, if you take me for bacon and eggs first.” But I kept my mouth shut and off we went with another vegetarian friend in tow. The event was held in the Roxburghe Hotel in Charlotte Square. Probably it was just as well it was under cover because Edinburgh’s summer was spitting rain at us when we arrived. The admission fee was a very reasonable two quid. Just as well because making food vegan seems to put the price up. One stallholder was serving tiny slices of pizza, smaller than the palm of my hand, for £2 a time. If you’ve ever wondered what Edinburgh’s entire vegan community would look like jammed under one roof, this was your chance. As you might expect, there were a lot of eco-warriors. The open-toe sandal brigade was out in force too. There was a sprinkling of goths, wearing vegan Doc Martens. But the most surprising thing was that most of the crowd looked pretty normal. The entire age spectrum was represented, from the kind of grannies you’d see at a church coffee morning to tiny babies strapped to backs and chests. As soon as we got in there was a roadblock. I realised why. It was the vegan cake stall. Not content with nibbling on a slice of Chocolate Mud Pie, slathered in dark vegan chocolate, I heard the young mum behind me say “Is it okay if we buy the whole cake?” The stallholder was delighted but the crowd round about her made grumbling noises – they all wanted a slice of Mud Pie too. We headed for the vegan cheese stall. Cheese is one of the many foods preventing me from going vegan. Here, the vendors weren’t allowed to call their products “cheese” for fear of breaching the Trades Descriptions Act so there were little tubs labeled “sheese”, “chease” and even “cheezly”. Louise Pinchen, the 22-year-old organiser and owner of the festival, must have been delighted because the main hall was bursting at the seams. 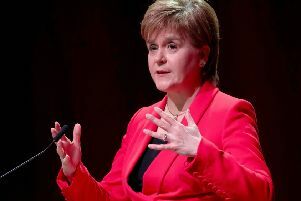 At one point she was panicking because Edinburgh council, which had said it would charge her around £300 to set up the event, ended up asking for £4000. Luckily a lot of the companies attending chipped in to help pay the bill. Even then, you’d have to say that the Roxburghe’s rooms weren’t big enough to cope with the crowds so next year, the festival may have to take place in the Assembly Rooms. It’s very difficult to relax and enjoy yourself or chat to the stallholders when the crush is so tight you can feel your internal organs being squashed up into your armpits. Somehow we did enjoy ourselves. Our vegan salted caramel ice cream with chocolate honeycomb topping may have cost £2.50 for one scoop but it was delicious. I don’t know what was in it but it was so heavy we felt like we’d just eaten a three-course meal. One thing that I’d expected to find there was notable by its absence: cookery demonstrations. Living with a vegan woman, I’ve learned that there are any number of ways to make hot, delicious vegan meals with ingredients that can be found at any supermarket. My wife’s vegan macaroni cheese is even better than the full-fat variety made with dairy products. What I’d love to see in Edinburgh is a big, covered indoor fruit and veg market like the kind you find in Paris, Barcelona, Rome and Budapest. The Budapest one’s my favourite because it has two bars so if you’re a male chauvinist you can stand and drink a pint of refreshing Staropramen while your wife does the shopping. That feels like the way forward for reluctant vegans like me. The Grecian temple on top of Calton Hill is nicknamed “Edinburgh’s Disgrace” because the city authorities never completed it. The city of Edinburgh itself is a work-in-progress too. Last week an Italian American tourist took issue with our beautiful town. She said it was dirty, inhospitable and parking was almost impossible. She wrote an open letter, spelling out her disgust in detail. Boy, did she strike a nerve! He was right. For once, the city streets were spotless. We took a cab down Leith Walk, usually a magnet for empty bottles and Styrofoam takeaway containers. It was immaculate. Even our own street, Cables Wynd, was completely litter-free. But by the weekend, it was back to square one. The backlash to this individual complaint was impressive. A lot of people wrote to this newspaper saying “cities are dirty, it’s nothing unusual, especially at this time of year with the Festival on”. Sadly that’s not the case. Cities don’t have to be dirty, no matter how crowded they get with tourists. In Barcelona, if you’re still on the street at 4am you risk being hosed into your hotel. They don’t just pick up every scrap of litter; they wash the city centre streets with water canons until they gleam. If you drop litter in Singapore, you will be fined on the spot. There is a zero tolerance policy for mess. The fine can be as much as $1000 and the punishment is to be sent on to the streets in a fluorescent orange jacket to pick up litter for 12 hours. Repeat offenders can be sentenced to six months in jail. There’s one simple solution I adopt. If I see litter, I pick it up and put it in the nearest bin. An even bigger problem for our council is dog mess. Last month we were promised a crackdown but there’s still no sign in the streets around Leith that this is being taken seriously. I’ve just spent three weeks in Budapest. Only once did I spot a little pile of you-know-what on the pavement. Part of the reason for this is that the city provides doggy toilets, with free plastic bags, a sand pit and well-marked waste bins. For the life of me I can’t understand why our own council doesn’t do the same. I have yet to catch any antisocial dog-walkers in the act of walking away from their pet’s manure; they must get up at five in the morning. I’d like to see this theory tested by our dog wardens being up and about at that time of the day too. A by-product of litter is seagulls. They’re rearing their chicks right now. If I so much as step out on to our bedroom balcony, they lock on like guided missiles and fly straight at me, only peeling away at the last second. I don’t like to upset them so I tend to step back inside the room. However, I am tempted to buy a Supersoaker and fight back. Would that be ethical?